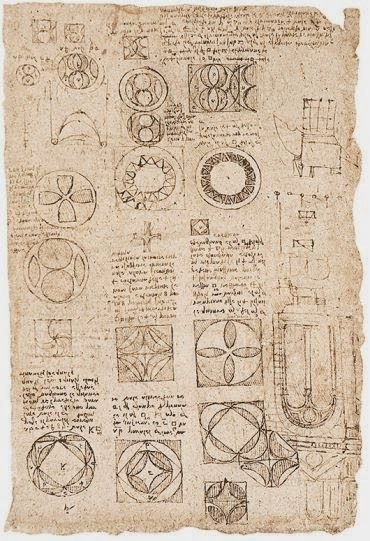 Henry Sotheran Ltd: The Codex Atlanticus of Leonardo Da Vinci. A primary source not only for research on Leonardo but also for studies of the history of science, art history, and Renaissance culture. The Codex Atlanticus is the largest collection of Leonardo da Vinci's papers ever assembled, demonstrating the scope of the genius of this extraordinary polymath. Sotherans are proud to offer this superb facsimile of Leonardo's drawings and papers contained within the Codex Atlanticus, each being reproduced actual size and in colour. Published in the years after the restoration of the sheets by conservators at the monastery of Grottaferrata in Lazio. Among a wealth of material there are preliminary studies for the portrait of Isabella d'Este, the Adoration of the Magi and the monuments of Francsco Sforza. 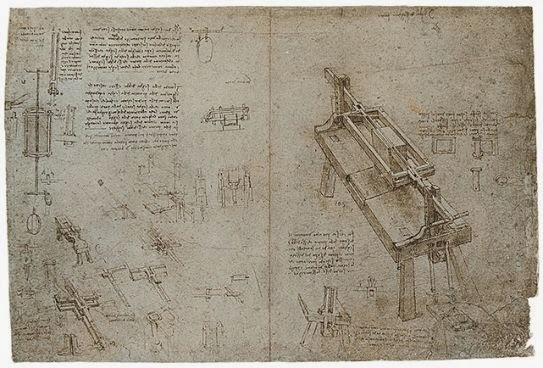 In addition there are designs and notes for the construction of a myriad of inventions, including flying machines, hydraulic pumps, siege machines and artillery as well as architectural plans, sketches and designs for churches, cupolas and buildings relating to the general town plan in which Leonardo provided his original solution to the issue of creating an ideal environment for Renaissance man. On Leonardo's death in France his papers were left to his pupil Francesco Melzi, including those that now are now contianed in the Codex Atlanticus. In 1570 after Melzi's death the papers passed to his heirs and subsequently a number of drawings were dispersed. The sculptor, Pompeo Leoni (1537-1608), retrieved a number of the papers from Melzi's heirs and together with other papers had them mounted on to large sheets and bound into a volume. In the seventeeth-century the volume was sold to the Marquis Galeazzo Arconati, who in 1637 donated it the Ambrosiana Library in Milan. As Carlo Pedretti notes in the two volume catalogue that accompanies the present item, the Codex Atlanticus is the largest collection of Leonardo da Vinci's papers ever assembled and the material it contains, 'encompasses the entire span of Leonardo's career, a period of over forty years, from about 1478, when he was 26, to his death in 1519. 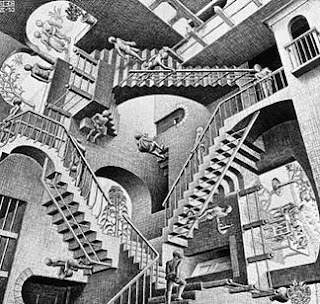 It provides the richest documentation not only for the story of his life, but above all for an assessment of his contributions to art, science, and technology; of his sources of learning, both Classical and Medieval, of his attitudes toward contemporary events, and, finally, of his visions of the future'. The present catalogue 'provides a much needed key to the understanding of Leonardo's intentions through each of the thousands of sheets and fragments in the codex. Each item is discussed in terms of its content, and its relationship to notes and drawings in other sheets of the codex and other Leonardo notebooks'. LEONARDO DA VINCI. The Codex Atlanticus of Leonardo Da Vinci. Firenze, C.E. Giunti-Barbera; New York and London, Johnson Reprint Corporation, Harcourt Brace Jovanovich, Publishers, 1973-1975. Large folio (610 x 446 mm) Twelve volumes bound in full brown leather, gilt-lettered spines; a total of 2136 colour facsimile plates, reproducing the original drawings to the recto, and where appropriate, to the verso of each plate, interleaved with a blank sheet, together with a copy of Carlo Pedretti's two volume descriptive catalogue of the papers and drawings contained within the codex, The Codex Atlanticus Of Leonardo Da Vinci. A Catalogue Of Its Newly Restored Sheets, both volumes bound in the original gilt-lettered grey cloth; pp. 256; pp. 317, . Limited edition of 998 numbered sets. 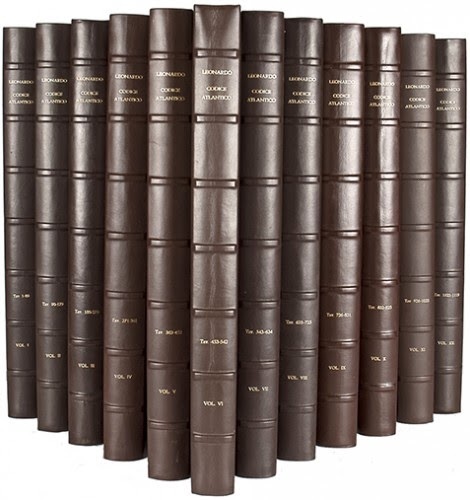 This item was selected from our most recent catalogue, History of Ideas, to view the catalogue online please click here.